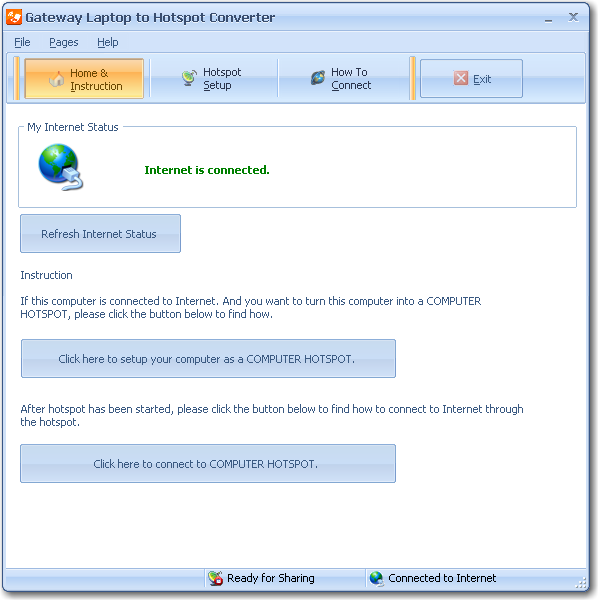 Gateway Laptop to Hotspot Converter converts your Gateway laptop to a wireless hotspot. By this software, your Gateway laptop (Windows platform) is turned into a Wi-Fi hotspot so that you can share the Internet with your second laptop or mobile devices. Of course you do not want to carry a wireless router while on the trip. But you have to find a Wi-Fi hotspot for your mobile. Laptop to Hotspot Converter Series software make your life easier. Convert your Gateway laptop to a wireless hotspot (laptop access point). ...... Laptop to Hotspot Converter Series software make your life easier. Now you can have your own hotspot anywhere. * Hotspot Anywhere - You do not need to carry a wireless router anywhere. Just make your laptop a hotspot with this easy and powerful software. * Secure & Reliable - You can set a security key for your laptop hotspot. * Mobile devices supported - Most mobile devices are supported to connect to the laptop hotspot such as iPhone, HTC (Windows Mobile) etc. Qweas is providing links to Gateway Laptop to Hotspot Converter 2.9 as a courtesy, and makes no representations regarding Gateway Laptop to Hotspot Converter or any other applications or any information related thereto. Any questions, complaints or claims regarding this application Gateway Laptop to Hotspot Converter 2.9 must be directed to the appropriate software vendor. You may click the publisher link of Gateway Laptop to Hotspot Converter on the top of this page to get more details about the vendor.